Time to look back at the 2017 season and pull out a few highlights. First up is the Tour of Flanders which is such a great race that the fear is the action on the day won’t live up to the high expectations. Only it did thanks to the return of the Kapelmuur and the comeback of Philippe Gilbert. The Muur was back in the route and it was decisive as Gilbert attacked and a move of 14 riders went clear with Quick Step putting their rivals into a panic. With 55km to go Gilbert attached and was not seen again until the finish. This was strong from Gilbert and helped by teamwork. Luck? Yes in that being away from others means not having them crash in front of you but taking th lead from so far out was a big gamble. Cast your mind back and the Tom Boonen retirement tour was a big thing only he’d drop his chain and get a bad bike change which dented his chances but allowed him to exit Flanders without having lost the race either, a mechanical rather than a physical. All the time Gilbert was in the lead he looked good but his lead didn’t and he was in range for the chasers and at risk of cracking which set up the drama nicely. 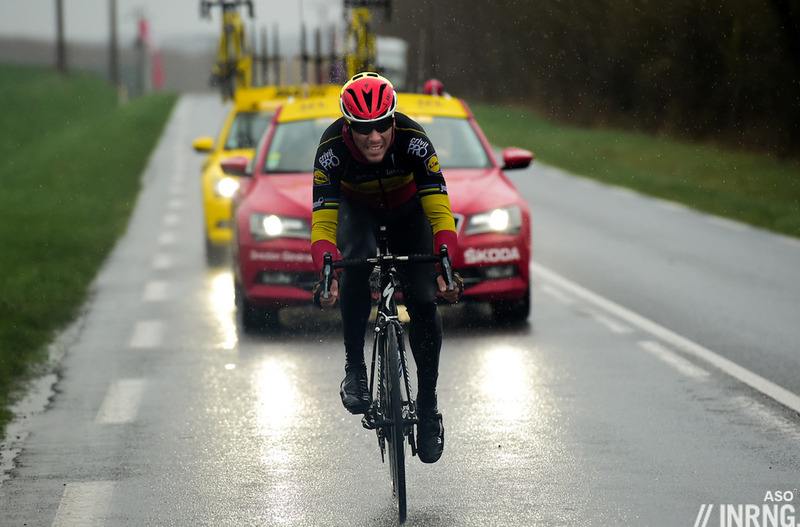 Gilbert put in a big attack in Paris-Nice and went solo on a grim day. It never looked like he’d win but viewed as a trial effort it makes more sense. His performance in De Panne gave another glimpse as he took the first stage and then the overall. Remember Sagan and that crash on the Kwaremont after he tangled with a jacket and the crash barriers? Maybe you do all over again now having forgotten it long ago but in the moment it was all over the media while Gilbert’s 50km raid seemed like a secondary story. Much was made of Gilbert being hungry on a one year deal with significant win bonuses. The incentives are there. But if the hypothesis is true then why didn’t he win big in his last year with BMC when results could have been traded for a big salary. Another hypothesis is that with age Gilbert is losing his jump, the ability to launch searing uphill attacks that few could match. If he’s lost the acceleration he has to attack from further out. Gilbert has talked about winning all the Monuments so he needs Milan-Sanremo and Paris-Roubaix. Is this a real objective or just part of pro cycling’s “what next” culture where no sooner does a rider win are they asked if they can win something bigger time? Sanremo seems a very big ask but based on De Ronde maybe Roubaix is within range. Definitely noted Gilbert’s long range attacking practice in the early season seeing it simply as honing form. In Flanders, it seemed to all make sense. Brilliant. Another example of a more mature rider understanding and playing to their strengths a la Valverde. With regard to the remaining two monuments, ambitious goals but just the thing to keep a guy like Gilbert motivated. Why not? A great Flanders and proof if it were needed that a classy attacking rider, who listens to his own instincts rather than those of a car borne drone and a radio, can still win one day classics. Let’s hope that others have noticed that waiting for the last few Ks is not the only game in town. Thou does jest surely – “listens to his own instincts”? The context to this race, in fact the entire Spring, was an on-going battle royale between Sagan and Quick Step. This was, in hindsight, perhaps the moment where the balance of power, hitherto with Sagan, perhaps shifted to the Belgians and they started to take the initiative. His bravery made the race, and he deserved the luck he got insofar as I still feel the chasers would have got him in the end (now that would have been an even more dramatic finale). But it was an absolute cracker of a race anyway. Why suggest jest. Have you never been in a position to have to make a judgement about your own abilities and the possibility of winning ? Gilbert made that call and judgement himself, so my point remains. The first man over the line is the winner, his name is on the winners roll call for eternity. What happens behind, and its implications only lead to the interesting pastime of conjecture. The team didn’t agree with Gilbert’s decision until it was clear that there was no way back. Gabriel. That is precisely the point I was making. Gilbert responded to his own sensations and not the combination of a drone sitting in the team car and the radio. But, nevertheless, it was quite clearly a QS tactic to attack on the Kwaremont and Gilbert was just told to “go” when the subsequent gap opened. To say it was all unpremeditated and down to ‘feel’ is incorrect. I can’t remember right now, but I think that the information we were given about the situation at the time was different. The attack on the Kwaremont was planned, Gilbert’s wasn’t. Suffice to say, from my perspective, that my feet were so firmly entrenched in the Sagan camp that this race was ultimately more of a let-down than highlight. A fantastic win – it was played tactically perfect with his team so strong behind, but absolutely reliant on his own physical strength too. The Sagan crash was important – Gilbert said himself that he purposefully accelerated on the Kwaremont in order to get out of sight by the time the chasers were at the bottom. It worked, they panicked, went into the red, and crashed. I think Gilbert will take the start in every P-R that he still can from now on. He’s said before that he definitely want to give it a try in the latter part of his carreer. He’s never really partaken before out of fear for crashes and injury. It was a truly great win well worthy of my favourite one day race. In hindsight though, he needed help. I cannot imagine he would have been alone had Sagan not strayed to close to the barriers. That was the moment he, and GVA, lost. Sure but staying upright is an integral part of trying to win a bike race as much so as putting your rivals under pressure to provoke a misjudgement. I thought one of the most telling things in that race was how GVA soldiered on and got second but Sagan was nowhere in the final result. Also Terpstra had a mechanical even before that famous incident obviously so he couldn’t guard the chasers anymore. If you want the ifs and buts related to important race incidents can go all the way back to the startline in Antwerpen. I was in awe of the way he was riding this spring. He looks like he has gained quite a bit of weight, thus transforming himself to a bit of a flatland racer as well. Put that into the basket, next to a huge anaerobic engine that can completely muscle over the hills, and you’ve got a handful to deal with in a Flanders type race. It was no accident he won. I don’t believe the others would have caught him at all, but anyway it can never detract from the glory of this win. Determination like this is rarely seen. He was in control, and looked like he could see nothing but victory already when he got in the break. It was the same in Amstel, he just looked like he couldn’t even consider losing that race. I didn’t believe he could win Flanders beforehand. But with this beauty, I believe if he has another day where everything comes together for him, he can win any race he sets his mind to. Ah Amstel was even better! I thought Kwiat had it tho, which made it all the more exciting! Likewise in awe of his riding this spring. Gilbert had been on the podium of de ronde before, his first two major classic wins were two editions of Omloop Het Nieuwsblad (one after a 50 km solo attack even!) and he’s always said he wants to win that race: Gilbert ha always been a ‘flanders type’ contender as much as a hilly classics guy. This should’ve been obvious for anyone following bike races during the last decade. Tbh I’m really starting to dislike this categorisation of such and such ‘type’ of rider, the real good ones can tackle any parcours and make the race come to live and carve out a win if it all clicks together. Road cycling is the toughest sport there is and once you’re on the top level it takes more than athletic prowess to start actually building a palmares, guys like Gilbert, GVA, Valverde, Nibali and Froome show this. Their level of determination, leadership and audacity is just higher than what other riders with similar physical capacities have. I was not in doubt that Gilbert had the physical capabilities before, but ever since his 2011 campaign I had doubts about him being hungry enough. I think since then I only saw him determined on a few occasions. Like when he won the worlds. I agree that it’s not all numbers, and I would love to go back to a time where the top guys competed in all the races. I’m just saying that we’ve seen riders specialize the last 20 years, so if you want to win a race you need to compete with those guys who sacrifice everything else to be competitive in that particular race. I agree with what you say about determination. And if one were so inclined, one could argue that Gilbert was content with counting his money for a while at BMC. Hence, you can be surprised when he comes out with the knife between his teeth like this season. Amstel was the demonstration of why Phil Gil is a great one day racer. It is very difficult to beat him in a one to one. Kwiat was maybe a bit quicker in a sprint, but Phil Gil succeeded in making him start from too far. He cracked him mentally. All this while he just had had a crash in drielandenpunt that put his spring to an end. Phillipe Gilbert was the highlight of 2017 for me, fantastic stuff and necking two “Amstels” on the podium was a nice touch, cheers Phil. A word for Oliver Naesen who was perhaps the biggest loser in the Sagan crash, given that he was badly affected and it wasn’t his fault at all. GvA was also caught up in it but fared better to still nab second. But Naesen looked comfortable in the company of Sagan and GvA and hopefully it’s a sign that he can compete in the monuments in 2018. I’m not as sure the chasers would’ve caught Gilbert as everyone else seems to be. Whos to say when they got within range they wouldn’t have all looked at each other and said ‘well don’t think I’m going to the front’, especially Sagan. Sagan seems to prefer losing races whilst looking like a big shot to actually winning them. Also Gilbert crossed the line holding his bike over his head, grinning from ear to ear after freewheeling and celebrating for 200 yards. He didn’t cross the line and sit hunched by the barriers desperately trying to catch some breath. Hardly the signs of a sitting duck who’s given all he has. Besides, the crash was one of the most clear examples of consequential accident. It wasn’t bad luck, it was knowingly taking risks (all the chasers did, Sagan deciding the line and the othrs just following). And taking risks means that there may be a price to be which is totally on you and a relevant part of racing. It’s called risky because bad things will probably happen. The other significant factor is that Gilbert shaped the race: *he* was on the front, which also comes with a price (in terms of effort), but it comes with a reward, too. It’s the most normal thing that the speed of the main or “selected” group may vary for whatever reason: but what happens more often than not in modern cycling is that there’s nobody among the big names who went on the attack before and is thus able to take advantage of those situations. Yet, even in recent history, we’ve got several examples showing that when a strong riders went sooner then expected and finds himself on the front, he can get a good result. But the fact we’ve become so used to the waiting game creates a bias which makes winning from far a cognitive *anomaly*, and that’s why most people tend to think that things would have gone otherwise “only if”… That’s possible, sure, but in this case it’s far from sure and not even probable, I’d say. Agreed on that too. Before the crash I already had in mind that it will be difficult to chase Phil Gil. Of course, the crash gave his definitive shape to the race, and this was quite lucky for him, but also he took a big risk in going away so far from arrival, and this deserved its reward.